Here’s the situation……I had a potluck on a work night but I didn’t want to show up to my first blogger meetup with storebought treats. What’s a girl to do? Make a cheat recipe of course! Prepare brownie mix by the box instructions. Pour into a prepared baking pan. Whip cream cheese until fluffy. Add sugar, egg yolk and vanilla. 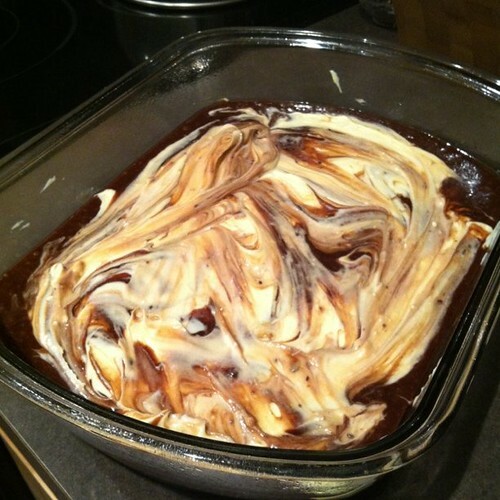 Spread cream cheese mixture evenly over brownie mix. Sprinkle with chocolate chips. Bake for 30 – 35 minutes or until the middle of the cheesecake layer puffs and is set. Cool completely before serving. Store in the refrigerator. Recipe Notes: These were awesome & no one was the wiser that they were a “cheater” recipe. Yummy!!! I am going to have to try those sometime! I love this recipe. And I love cheater recipes. Sometimes they are just what the busy Mom needs. Thanks for being such a great What’s Cooking Wednesday supporter. I appreciate it! Oh my goodness, these sound DIVINE. Definitely going to have to try this recipe! Love it!